Scrub down all surfaces with an all-purpose cleaner consisting of one-part vinegar and nine parts lavender infusion. 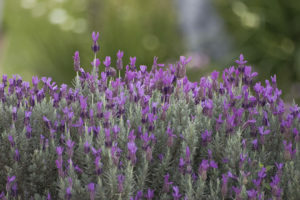 Both the vinegar and lavender have antibacterial properties, with added fragrance from the lavender. Freshen your carpets with a mix of ¾ cup baking soda, ¼ cup cornflour and ¼ cup lavender flowers stripped off the stems. Sprinkle this mix onto the carpet, leave overnight to absorb odours and dirt, and then vacuum. Make a quick potpourri to freshen a room using lavender flowers, dried leaves, seeds, bark and citrus peels. Add a fixative (like orris or vetiver root) to hold the scent. Revitalise a room with a quick spritz from a spray bottle filled with a strong infusion of lavender.